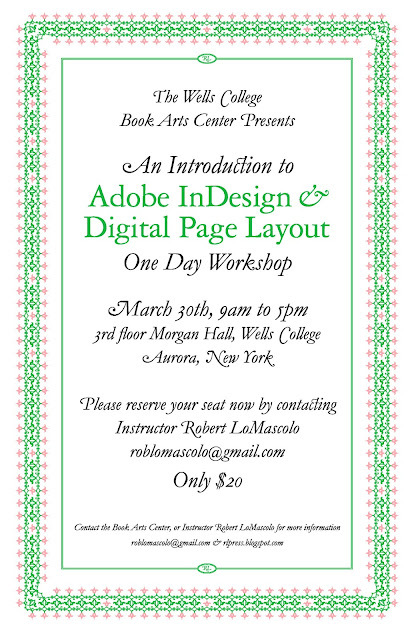 The Press of Robert LoMascolo: InDesign Workshop March 30th . 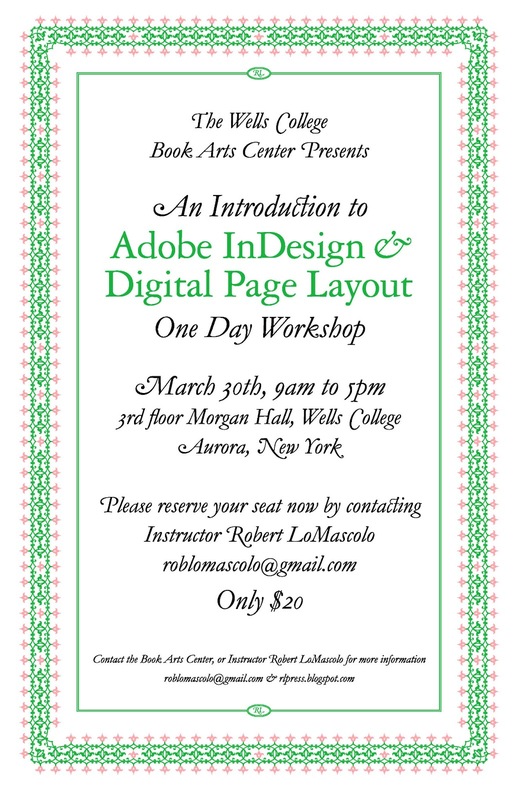 . .
InDesign Workshop March 30th . . . In this one day crash course we will explore the potential and basic operation of Adobe InDesign. With its wide professional adoption, and seamless compatibility with other industry-standard Adobe applications such as Photoshop, Illustrator, and Acrobat, this course will offer you many useful skills for this digital age. Whether you are looking to make a quality poster, or professional looking document or résumé, this course is for you! We will begin by going through the primary tools and functions of the software with the emphasis being on achieving professional looking results as simply as possible. I encourage you to bring both text and digital images on a CD or flash drive that you would like to use. For the purposes of this course, I encourage you to consider coming with a plan for a poster or, if you are feeling ambitious, a simple two sided card or brochure. At the end of the course everyone should leave with a better understanding of the software, a few useful design tips, and a complete or at least well formulated project. Location: 3rd floor Digital Lab, Morgan Hall, Wells College, Aurora, New York. Basic computer knowledge required. No InDesign experience needed. Price is only $20 per student. Lunch on your own, or bring a bagged lunch. Contact Instructor Robert LoMascolo for more information, or to sign up. Please reserve your spot in advance. 9am We will begin with a quick opening and everyone will have a chance to introduce themselves to the class and mention their personal goals for the course. 9:30 Immediately after introductions you will be asked to open InDesign on one of the Lab computers. We will discuss setting up a document and begin to highlight the basic InDesign tools such as the black arrow, white arrow, text tool, and magnifying glass. 10:30 By this time you will be able to begin placing your content in your own document. I will demonstrate guidelines and explain the ruler. We will discuss how to insert a photo, and how to create text boxes. I will demonstrate how to crop and properly resize photos. 10:45-11 You may take a break if needed, and I will be available to work one on one with those who would like to stay. 11-12 We will begin to discuss some basic steps we can take towards better typography. I will give my personal opinions on how to choose an appropriate typeface, and adjust the leading and point size accordingly. 12-1:30 Lunch on your own. 1:30-3 The afternoon will be devoted to making subtle adjustments and using a few of the more advanced, but helpful, features of InDesign. I will demonstrate how to add pages to the document, as well as mention the master page. I will demonstrate how to add a drop cap, and mention letter spacing, small caps, and ligatures. I will introduce the glyphs palette, and explain how to change the color of text. 3-3:15 You may take a break if needed, and I will be available to work one on one with those who would like to stay. 3:15 We will discuss how to print and export finished documents to a PDF, or JPG. 3:45 Everyone will print an “in progress” copy of what they have been working on and we will discuss the results as a class. The remaining class time will be devoted to making final changes to our projects. 5-5:30 Class is dismissed. I will be available for a half hour or so after class for anyone who would like to stay or ask additional questions.